Police officer Megan Luz and her loyal K-9 partner Brigit are back on the beat-and under the gun-when the local rodeo show goes to the dogs. After capturing the notorious Fort Worth “Tunabomber,” Megan and Brigit are practically celebrities. Which is why the police chief lassoed them into doing rodeo duty -mostly as a public relations stunt for the department. Megan’s not a fan of calf roping, bull riding, or goat milking contests. 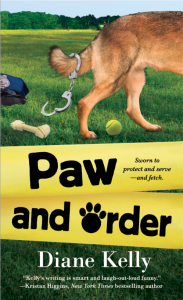 But when a small-time thief appears to be working the circuit, her trusty K-9 partner starts sniffing for clues… Add an attractive mounted deputy to the mix and readers are in for a wild ride!